Thiry D.; Mauroy A., Saegerman C., Licoppe A., Fett T., Thomas I., Brochier B., Thiry E., Linden A.
Molecular evidence of Anaplasma phagocytophilum in wild boar (Sus scrofa) in Belgium. Obsomer V, Wirtgen M, Linden A, Claerebout E, Heyman P, Heylen D, Madder M, Maris J, Lebrun M, Tack W, Lempereur L, Hance T & Van Impe, G. (2013). Spatial disaggregation of tick occurrence and ecology at a local scale as a preliminary step for spatial surveillance of tick-borne diseases: general framework and health implications in Belgium. Linden A, Desmecht D, Volpe R, Wirtgen M, Grégoire F, Pirson J, Paternostre J, Kleijnen D, Schirrmeier H, Beer M & Garigliany MM. (2012). Epizootic spread of schmallenberg virus among wild cervids, Belgium, fall 2011. Emerging Infectious Diseases, 18(12): 2006-2008. In D., Gavier-Widen, P., Duff, & A., Meredith (Eds. ), Infectious Diseases of Wild Mammals and Birds in Europe, 281-288. Wiley-Blackwell. Garigliany MM, Bayrou C, Kleijnen D, Cassart D, Jolly S, Linden A & Desmecht D. (2012). Schmallenberg virus: a new Shamonda/Sathuperi-like virus on the rise in Europe. Grégoire F, Mousset B, Hanrez D, Michaux C, Walravens K & Linden A. (2012). A serological and bacteriological survey of brucellosis in wild boar (Sus scrofa) in Belgium. Lempereur L, Wirtgen M, Nahayo A, Caron Y, Shiels B, Saegerman C, Losson B & Linden A. (2012). Wild cervids are host for tick vectors of Babesia species with zoonotic capability in Belgium. Vector Borne Zoonotic Diseases, 12(4): 275-280. Ooka T, Seto K, Linden A, Bardiau M, Mainil J & Hayashi T. (2012). Clinical significance of Escherichia albertii. Emerging Infectious Diseases, 18(3): 488-492. Linden A, Wirtgen M, Nahayo A, Heyman P, Niedrieg M & Schulze Y. (2012). Tickborne encephalitis virus antibodies in wild cervids in Belgium. Cochez C, Lempereur L, Madder M, Claerebout E, Simons L, De Wilde N, Linden A, Saegerman C, Heyman P & Losson B. (2011). Foci report on indigenous Dermacentor reticulatus populations in Belgium and a preliminary study of associated babesiosis pathogens. Medical and Veterinary Entomology, 26(3): 355-358. Proaño-Perez F, Benitez W, Portaels F, Rigouts L & Linden A. (2011). Situation of bovine tuberculosis in Ecuador. Revista panamericana de salud publica, 30(3): 279-286. Proaño-Perez F, Benitez-Ortiz W, Desmecht D, Coral M, Ortiz J, Ron L, Portaels F, Rigouts L & Linden A. (2011). Post-mortem examination and laboratory-based analysis for the diagnosis of bovine tuberculosis among dairy cattle in Ecuador. Preventive Veterinary Medicine, 101(1-2): 65-72. Linden A, Wirtgen M, Volpe R, Nahayo A, Pirson J, Paternostre J & Grégoire F. (2011). 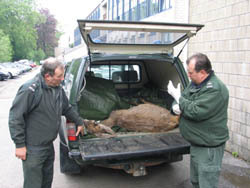 Surveillance of wildlife diseases in Belgium. Epidémiologie et Santé Animale, 59-60: 213-215. Wirtgen M, Nahayo A, Linden A, Losson B, Garigliany MM & Desmecht D. (2011). Detection of Anaplasma phagocytophilum in Dermacentor reticulatus ticks. Bardiau M, Grégoire F, Muylaert A, Nahayo A, Duprez JN, Mainil J & Linden A. (2010). Enteropathogenic (EPEC), enterohaemorragic (EHEC) and verotoxigenic (VTEC) Escherichia coli in wild cervids. Journal of Applied Microbiology, 109(6): 2214-2222. Lebrun M, Mainil J & Linden A. (2010). Cattle enterotoxaemia and Clostridium perfringens: description, diagnosis and prophylaxis. Linden A, Grégoire F, Nahayo A, Hanrez D, Mousset B, Massart L, De Leeuw I, Vandemeulebroucke E, Vandenbussche F & De Clercq K. (2010). Bluetongue virus in wild deer, Belgium, 2005-2008. Emerging Infectious Diseases, 16(5): 833-836. Proaño-Perez F, Benitez-Ortiz W, Celi-Erazo M, Ron-Garrido L, Benitez-Capistros R, Portaels F, Rigouts L & Linden A. (2009). Comparative intradermal tuberculin test in dairy cattle in the north of Ecuador and risk factors associated with bovine tuberculosis. American Journal of Tropical Medicine and Hygiene, 81(6): 1103-1109. Van Galen G, Busoni V, Sandersen C, Verwilghen D, Cassart D, Linden A, Fortier G & Amory H. (2009). A case of a periarticular abscess and suppurative arthritis of the atlanto-occipital joint. Equine Veterinary Education, 21(7): 340-343. Votion D, Linden A, Delguste C, Amory H, Thiry E, Engels P, Van Galen G, Navet R, Sluse F, Serteyn D & Saegerman C. (2009). Atypical myopathy in grazing horses: a first exploratory data analysis. Desmecht D, Vanden Bergh R, Sartelet A, Leclerc M, Mignot C, Misse F, Sudraud C, Berthemin S, Jolly S, Mousset B, Linden A, Coignoul F & Cassart D. (2008). Evidence for transplacental transmission of the current wild-type strain of bluetongue virus serotype-8 in cattle. Grégoire F, Mousset B, Hanrez D, Cassart D, Desmecht D & Linden A. (2008). Cavernous hemangiosarcoma in a free-living red deer (Cervus elaphus). Linden A, Mousset B, Grégoire F, Hanrez D, Vandenbussche F, Vandemeulebroucke E, Vanbinst T, Verheyden B & De Clerck K. (2008). Bluetongue virus antibodies in wild red deer in southern Belgium. Votion D, Linden A, Saegerman C, Engels P, Erpicum M, Thiry E, Delguste C, Rouxhet S, Demoulin V, Navet R, Sluse F, Serteyn D, Van Galen G & Amory H. (2007). History and clinical features of atypical myopathy in horses in Belgium (2000-2005). Journal of Veterinary Internal Medicine, 21(6): 1380-1391. Prevot V, Tweepenninckx F, Van Nerom E, Linden A, Content J & Kimpe A. (2007). Optimization of polymerase chain reaction for detection of Clostridium botulinum type C and D in bovine samples. Zoonoses and Public Health, 54(8): 320-327. Thiry J, Widen F, Grégoire F, Linden A, Belak S & Thiry E. (2007). Isolation and characterisation of a ruminant alphaherpesvirus closely related to bovine herpesvirus 1 in a free-ranging red deer. BMC Veterinary Research, 3: 26. Lebrun M, Filée P, Galleni M, Mainil J, Linden A & Taminiau B. (2007). Purification of the recombinant beta2 toxin (CPB2) from an enterotoxaemic bovine Clostridium perfringens strain and production of a specific immune serum. Protein Expression & Purification, 55(1): 119-131. Martin N, Mousset B, Duprez JN, Grégoire F, Hoyoux A, Linden A & Mainil J. (2007). Profils de résistance aux antibiotiques de souches d’Enterococcus sp et d’Escherichia coli isolées dans les matières fécales de sangliers et cervidés sauvages. Annales de Médecine Vétérinaire, 151: 55-60. Lebrun M, Filée P, Mousset B, Desmecht D, Galleni M, Mainil J & Linden A. (2007). The expression of Clostridium perfringens consensus beta2 toxin is associated with bovine enterotoxaemia syndrome. Palm M, Leroy M, Thomas A, Linden A & Desmecht D. (2007). Differential anti-influenza activity among allelic variants at the Sus scrofa Mx1 locus. Journal of Interferon & Cytokine Research, 27(2): 147-155. Cassart D, Baise E, Cherel Y, Delguste C, Antoine N, Votion D, Amory H, Rollin F, Linden A, Coignoul F & Desmecht D. (2007). Morphological alterations in oxidative muscles and mitochondrial structure associated with equine atypical myopathy. Equine Veterinary Journal, 39(1): 26-32. Roels S, De Bosschere H, Saegerman C, Desmecht D, Vanopdenbosch & Linden A. (2005). First results of chronic wasting disease (CWD) surveillance in the south-eastern part of Belgium. Thomas A, Linden A, Mainil J, Bischof D, Frey J & Vilei E. (2005). Mycoplasma bovis shares insertion sequences with Mycoplasma agalactiae and Mycoplasma mycoides subsp. mycoides SC: evolutionary and developmental aspects. FEMS Microbiology Letters, 245(2): 249-255. Thomas A, Leprince P, Dizier I, Ball HJ, Gevaert K, Van Damme J, Mainil J & Linden A. (2005). Identification by two-dimensional electrophoresis of a new adhesion expressed by a low-passaged strain of Mycoplasma bovis. Research in Microbiology, 156(5-6): 713-718. Sources of tuberculous-like lesions in Belgian wild boars. Govaerts M, Volpe R, Vionnet A, Grégoire F, Ceuleers V, Jouant L, Paternostre J, den Haerynck M, Cassart D, Linden A. 5th Symposium of the Belgian Wildlife Disease Society, Tervuren (Belgium), 18/10/2013. Detection of antibodies against Schmallenberg virus in wild boar, Belgium, 2010-2012. Desmecht D., Garigliany M-M., Beer M., Schirrmeier H., Paternostre J., Volpe R., Linden A. 31st International Union of Game Biologists congress (IUGB), Brussels (Belgium), 27>29/08/2013, pg 131. Schmallenberg virus circulation among red deer and roe deer populations in Belgium. Garigliany M-M., Volpe R., Paternostre J., Desmecht D., Linden A. 31st International Union of Game Biologists congress (IUGB), Brussels (Belgium), 27>29/08/2013, pg 272. Infection of mycobacterium avium paratuberculosis and mycobacterium avium hominissuis in a wild red deer. Volpe R., Paternostre J., Ceuleers V., Jouant L., Cassart D., Govaerts M., Linden A. 31st International Union of Game Biologists congress (IUGB), Brussels (Belgium), 27>29/08/2013, pg 278. Aujeszky’s disease virus seroprevalence in wild boar, Southern Belgium, 2012. Jouant L., Wayet J., Volpe R., Ceuleers V., Paternostre J., Massart L., Linden A. 31st International Union of Game Biologists congress (IUGB), Brussels (Belgium), 27>29/08/2013, pg 281. Detection of Mycobacterium celatum in wild boars in Southern Belgium. Ceuleers V., Vionnet A., Grégoire F., Volpe R., Jouant L., Paternostre J., Govaerts M., Linden A. 31st International Union of Game Biologists congress (IUGB), Brussels (Belgium), 27>29/08/2013, pg 282. La faune sauvage est-elle un réservoir ? Colloque tuberculose FORMAVET, Wierde (Belgique), 19/06/2013. Perspectives en matière de diagnostic de la paratuberculose bovine. Colloque vétérinaire « La paratuberculose au centre de nos préoccupations », Les Isnes (Belgique), 19/10/2012. Hepatitis E virus infection of wild boar (Sus scrofa) in southern Belgium. Thiry D., Mauroy A., Brochier B., Thomas I., Pirson J., Volpe R., Thiry E., Linden A. International Wildlife Disease Association conference (WDA/EWDA), Lyon (France), 26/07/2012, pg 238. Anaplasma phagocytophilum infection in Roe deer (Capreolus capreolus) in southern Belgium. Nahayo A., Wirtgen M., Grégoire F., Volpe R., Paternostre J., Pirson J., Linden A. International Wildlife Disease Association conference (WDA/EWDA), Lyon (France), 26/07/2012, pg 294. Extraintestinal lesions associated with Mycobacterium avium paratuberculosis in wild cervids. Volpe R., Grégoire F., Wirtgen M., Paternostre J., Cassart D., Govaerts M., Linden A. International Wildlife Disease Association conference (WDA/EWDA), Lyon (France), 27/07/2012, pg 381. A case of meningitis and orchitis in a hare (Lepus europaeus) due to Francisella tularensis. Grégoire F., Wirtgen M., Volpe R., Nahayo A., Paternostre J., Pirson J., Cassart D., Madani N., Linden A. International Wildlife Disease Association conference (WDA/EWDA), Lyon (France), 27/07/2012, pg 390. Maladies : quel impact sur les populations de lièvre ? Colloque « Demain la chasse : comment reprendre l’initiative ? », Wépion (Belgique), 26/06/2012. 10èmes Journées de l’Enseignement post-universitaire de la Faculté de Médecine de Liège, CHU Sart Tilman (Belgique), 12/05/2012. Comportement anormal et altérations pathologiques du gibier sauvage résultant de maladies, d’une contamination environnementale ou de tout autre facteur susceptible d’affecter la santé humaine après consommation. – Namur, Facultés Notre Dame de la Paix, juin 2007, 2008, 2009 et 2010. Workshop for OIE National Focal Points on Wildlife, Bulgaria, 23-25/01/2012. Causes of mortality in roe deer (Capreolus capreolus) in Southern Belgium : results of the passive surveillance 2010. Grégoire F., Wirtgen M., Volpe S., Nahayo A., Pirson J., Paternostre J., Linden A. 4th Symposium of the Belgian Wildlife Disease Society, Brussels (Belgium), 7/10/2011, pg 46. Dermacentor reticulatus as vector of Anaplasma phagocytophilum ? Wirtgen M., Heyman P., Cochez C., Grégoire F., Volpe S., Nahayo A., Pirson J., Paternostre J., Linden A. 4th Symposium of the Belgian Wildlife Disease Society, Brussels (Belgium), 7/10/2011, pg 55. La surveillance des maladies de la faune sauvage en Belgique. Linden A., Moinet M., Wirtgen M., Volpe S., Pirson J., Paternostre J., Nahayo A., Grégoire F.
Atelier sur la surveillance des maladies de la faune sauvage dans le monde francophone, Québec (Canada), 14/8/2011. Suivi sanitaire du Lièvre brun en Région wallonne. Présentation orale au Conseil Cynégétique du Roman Païs, Nivelles (Belgique), 20/6/2011. Oral presentation to International Conference on Animal Health Surveillance, Lyon (France), 17-20/5/2011. Animal Health and Biodiversity – Preparing for the Future. OIE Global Conference on Wildlife, Paris (France), 23-25/2/2011. Rôle de la faune sauvage dans l’épidémiologie de la paratuberculose. In proceedings : Présentation orale à la 4e Journée Technique GTV – Vét’el, Sainte Catherine Les-Arras (France), 18/11/2010. Bluetongue in wild cervids: actual situation in Belgium. In proceedings : Oral presentation to Association Suisse de Pathologie animale, Bâle (Suisse), 24/6/2010. Role of wildlife in epidemiology of paratuberculosis. Oral presentation to Colloquium “paratuberculosis of ruminants”, National Vétérinary of Alfort, 10/6/2010. La faune sauvage, réservoir potentiel de maladies transmissibles à l’homme. Présentation orale au Congrès VetEvent, Spa (Belgique), 27-28/03/2010. A three-year on Anaplasma phagocytophilum in wild cervids populations in Southern Belgium. Nahayo A., Heyman P., Cochez C., Grégoire F., Pirot P., Hanrez D., Mousset B., Linden A. 3rd Symposium of the Belgian Wildlife Diseases Society, Brussels (Belgium), 16/10/2009, pg 45. Cause of mortality and diseases in hare (Lepus europaeus) in Southern Belgium. Grégoire F., Hanrez D., Mousset B., Bodeux A., Pirot P., Nahayo A., Linden A. 3rd Symposium of the Belgian Wildlife Diseases Society, Brussels (Belgium), 16/10/2009, pg 46. Bluetongue in wild ruminants (Cervus elaphus) in southern Belgium. Linden A., Mousset B., Grégoire F., Hanrez D., Vandemeulebroucke E., Vandenbussche F and De Clercq K.
Oral presentation to 8th conference of the European Wildlife Disease Association, Rovinj (Croatia), 2-5/10/2008, pg 8. Evidence of European Brown Hare Syndrome in Southern Belgium. Grégoire F., Hanrez D., Mousset B., Nahayo A., Pirot P. and Linden A. 8th conference of the European Wildlife Disease Association, Rovinj (Croatia), 2-5/10/2008, pg 63. Improvement of the organisation of wildlife disease surveillance in Belgium : The WildSurv project. Tavernier P., Linden A., Pirot P., Heyman P., Dessers R., Dobly A., Dispas M. and Roels S.
8th conference of the European Wildlife Disease Association, Rovinj (Croatia), 2-5/10/2008, pg 90. Suivi sérologique de la Brucellose chez le sanglier en Région wallonne : bilan de 6 années d’études. Grégoire F., Mousset B., Hanrez D., Walravens K., Linden A.
Présentation orale au 4e Colloque International Francophone de microbiologie animale, Saint-Hyacinthe (Province du Québec, Canada), 22-24/09/2008. Bluetongue in wild cervids in Southern Belgium : data 2006. Linden A., Grégoire F., Hanrez D., Mousset B., De Clerck K.
Oral presentation to 2nd Symposium of the Belgian Wildlife Diseases Society, Brussels (Belgium), 13/10/2007, pp 9-10. Grégoire F., Mousset B., Hoyoux A., Desmecht D. & Linden A. 2nd EWDA Workshop, Thessalonique (Grèce), 27-29/04/2007. Chronic Wasting Disease Surveillance (CWD) in Belgium preliminary data. Roels S., De Bosschere H., Saegerman C., Linden A., Neukermans A., Berkvens D., Casaer J. and Vanopdenbosch E.
6th International TSE Conference, Paris (France), 13/12/2006. Le sanglier et le lièvre européen : 2 espèces réservoirs de Brucella suis biovar 2 en Wallonie? Grégoire F., Mousset B., Hoyoux A., Bâbe M.H., Canivet P., Walravens K. & Linden A. In proceedings, 3ème Colloque International Francophone de Bactériologie Vétérinaire, Liège, 2006, 11-13/07/06. Comparaison de 2 tests sérologiques pour la mise en évidence d’anticorps vis-à-vis de Mycobacterium avium subspecies paratuberculosis chez des cerfs sauvages. Mousset B., Grégoire F., Hoyoux A., Walravens K., Marché S., Govaerts M. & Linden A.
Tulareamia, an emerging zoonosis in Belgium ? Walravens K., Bughin J., Roels S., Sion C., Linden A., Reginster M., Godfroid J., Govaerts M., Gregoire F., Troussart J-M. & Saegerman C.
In proceedings, 1st symposium of the BWDS , Neder-Over-Embeek, 24-25/11/2005 pg 16. Paratuberculosis in wild red deer (Cervus elaphus) in Southern Belgium. Linden A., Grégoire F., Mousset B., De Rijk P., Rigouts L. & Desmecht D.
In proceedings, 1st symposium of the BWDS , Neder-Over-Embeek, 24-25/12/2005 pg 15. Screening for chronic wasting disease-specific prion protein in Belgian free-ranging cervids. Roels S., Saegerman C., De Bosschere H., Berkvens D., Grégoire F., Hoyoux A., Mousset B., Desmecht D., Vanopdenbosch E. & Linden A. In proceedings, 1st symposium of the BWDS , Neder-Over-Embeek, 24-25/11/2005 pg 21. Hemangiosarcoma in a wild red deer (Cervus elaphus). In proceedings, 1st BWDS , Neder-Over-Embeek, 24-25/11/2005 pg 29. Epidémiosurveillance des maladies de la faune sauvage. Linden A., Grégoire F, Hoyoux A., Mousset B.
Présentation orale à la Faculté de Médecine Vétérinaire, Université de Liège, 12/05/2005, pp 49-57. Serological prevalence of infection by Brucella spp. in free-living boars in Southern Belgium. Emerging Diseases and Zoonoses in Wildlife Reservoirs. Grégoire F., Mousset B., Hoyoux A., Bâbe M.H., Canivet P., Godfroid J., Walravens K. & Linden A. 1rst EWDA Workshop, Les Pensières, Veyrier-du-Lac (France), 28/04 – 01/05/2005. pp 18-19. Monitoring of wild cervids paratuberculosis (Mycobacterium avium subspecies paratuberculosis) in Southern Belgium. Linden A., Grégoire F., Mousset B., Hoyoux A. Canivet P., de Rijk P., Rigouts L. et Desmecht D.
In proceedings : Oral presentation to “European Wildlife Disease Association”, Uppsala, 8-10/09/2004, pg 33. Distribution of exon 14 allelic forms at the porcine Myxovirus resistance locus (Mx1) among West European populations of wild and domestic pigs. Thomas A., Palm M., Baise E., Gerardin J., Bâbe MH., Linden A., Desmecht D.
Serological prevalence of infection by a herpesvirus related to infectious bovine rhinotracheitis virus in free-living ungulates in South of Belgium. Grégoire F., Mousset B., Hoyoux A., Canivet P., Keuser V., Thiry E., Linden A.
Intestinal lesions and bacterial countings suggestive of Clostridium perfringens enterotoxaemia as a cause of mortality in wild cervids. Canivet P., Mousset B., Grégoire F., Hoyoux A., Duprez JN et Linden A. In proceedings : Diagnosis, epidemiology and antibiotic resistance of the genus Clostridium. Parme, 2003, pp 17-18. Palm M., Thomas A., Baise E., Gerardin J., Bâbe MH., Linden A., Desmecht D.
In proceedings : Journées scientifiques de l’AESA – AEEMA. Maisons-Alfort, France 2003. Dictyocaulose chez les cervidés sauvages en Wallonie. Canivet P., Mousset B., Ferté H., Depaquit J., Gianfreda H., Losson B. et Linden A. In proceedings : Journées scientifiques de l’AESA – AEEMA. Maisons-Alfort 2003, pp 34-35. Prévalence des Escherichia coli vérotoxinogènes chez les cervidés sauvages en Wallonie. Canivet P., Mousset B., Pirson V., Jacquemin E., Daube G., Mainil J. et Linden A. 2ème Colloque International Francophone de Bactériologie Vétérinaire, Ploufragan, 2002, pp 19-20. Evidence of paratuberculosis in wild red deer (Cervus elaphus) in Belgium. Linden A., Canivet P., Mousset B., de Rijk P., Rigouts L. and Portaels F.
7th International Colloquium on Paratuberculosis, Bilbao, Spain, 2002, pg 140. ANIMAL SAUVAGE TROUVÉ MORT, QUE FAIRE ? Abonnez-vous et recevez une notification pour chaque nouvel article publié.